This piece is inspired by "My Name" from The House On Mango Street by Sandra Cisneros. It is meant to explore the relationships we have to our names the expectations we once gave ourselves about them. When I was young, I was obsessed with my name and anyone who shared it. I thought we were all secretly connected, a society of Elizabeths. I devoured books about Queen Elizabeth I, quietly imagining between library shelves that I could be like her. I wanted to be like her. I wasn't strong, I was shy, I was quiet. If a woman with my own name could be fierce, I could be to. I told myself that I could rule a nation with a compassionate heart and a Spanish Armada. I could cast off men like stinging bees and never worry if they liked me like they liked my friends. Queens cannot be insecure, I whispered to myself. Queens are strong and regal and elegant. I could by that too. One day, I promised myself, one day I will be. I lost the infatuation with my name around the same time I started hearing nicknames fall out of my friends’ mouths. It wasn't their fault; I enjoyed it and never corrected them. 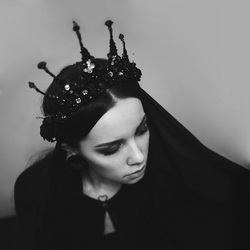 I started to forget the promises I made to myself and forgot that I could be queen. Forgot I could be anything at all. Elizabeth got lost in Lizzy and then in the anticipation of who I was going to become rather than who I already was. It's difficult to focus on who you are right this very second if you're worrying about where you will be five years, ten years from now. I didn't come back to my name until I left home. Perhaps this was the most poignant move of my entire life. I left behind the family that graced me with my name despite their blood running in my veins. I left behind Lizzy despite it being carved into my high school ring. I moved five and a half hours in order to become the person I had worried about becoming. Then, and only then, did I realize that I couldn't become Elizabeth until I started being here, in this moment. A journey cannot begin if you are expecting to be at the end before even taking the first step. Queen Elizabeth. Adult Elizabeth. Strong Elizabeth. I am those things and more now. I am not exactly the way I imagined myself. A half shaved head and leather boots is not exactly how middle school Lizzy pictured herself becoming. I do not own a Spanish Armada. I do not rule a nation with a gentle heart and an iron fist. These things are not needed for me to be Queen Elizabeth. I am her and I have surpassed my own expectations of myself. Perhaps my name no longer fit me once, my expectations needed to change more than I admitted, but, in the end, I have come back to my name time and time again. It is the first thing I tell about myself to people. The rest they must find out on their own.